At one time or another we all need to punch a hole, whether for home or office we have you covered. 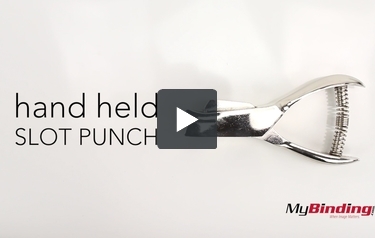 This classic Hand Held Round Hole Punch is just the ticket for getting the job done. The hole size of this classic beauty is 3/16 (5MM). Why not pick one up today. Thank you for your question. All of the hand punches we carry are designed to be used with paper. If the aluminum plate is thin enough the may be able to punch a hole in it but unfortunately we would not be able to provide a definitive answer as it is outside of the punches designed use. Is there any way of creating a custom hole puncher? Unfortunately at this time we do not have a option for custom shaped hole punches. Your local scrap booking store would be a good resource to check.